Each January as the nation commemorates the sad anniversary of the Roe v. Wade decision, marches are held, and vigils are prayed. Those committed to the cause of human rights of the unborn make their voices heard. This year, pro-abortion politicians fearing increased restrictions on abortion have advocated for and passed laws expanding access to abortion in the state of New York. Similar attempts are being been made in several other states. I encourage the faithful to turn to our Lord in prayer for our political leaders. Sir Thomas More was a public servant who preferred to die at the hands of civil authorities rather than abandon Christ and the Church. Let us also keep the unborn, as well as all pregnant mothers, in our prayers. 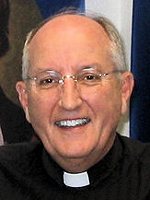 As Chaplain of our Council, I often remind our Brother Knights, that the “best possible advertising for the Knights of Columbus. . .are the Knights themselves!” That was certainly the case last Saturday night, when our Bishop Salpointe Council hosted the 29th Annual Catholic Appeal Dinner in Columbian Hall. This annual gift to the Parish – a wonderful meal, served by Knights and their Ladies – has provided the vital “kick-off” for the Appeal, which supports 26 ministries in our Diocese. This was the second year that our new Bishop, Edward Weisenburger, was able to join us for the Mass (with a 4th Degree Honor Guard) and the Dinner following. Looking around the Hall, I could see, standing behind the serving lines, behind the bar, in the kitchen, directing our Confirmation student ‘table servers’, welcoming parishioners – were the KNIGHTS! There simply could not be a better illustration of the vital role of the Knights of Columbus in our Parish. Any Catholic man present could see for himself, the difference that Knights of Columbus make, in building up the life of the Church! Any Catholic man present should have come away with a strong impression of what the Knights are truly about: Faith active in service! I am always proud that I am a Knight, but especially on these occasions – and there are many of them – when our Council provides the leadership needed to make our Parish great! My heartfelt thanks to all of the Brothers and their Ladies, who welcomed our Bishop and our St. Andrew/Good Shepherd parishioners to the best Annual Catholic Appeal ever! Columbian Hall - 156 W. Kayetan. Please feel free to stop by and find out more. We are named Bishop Salpointe Council. 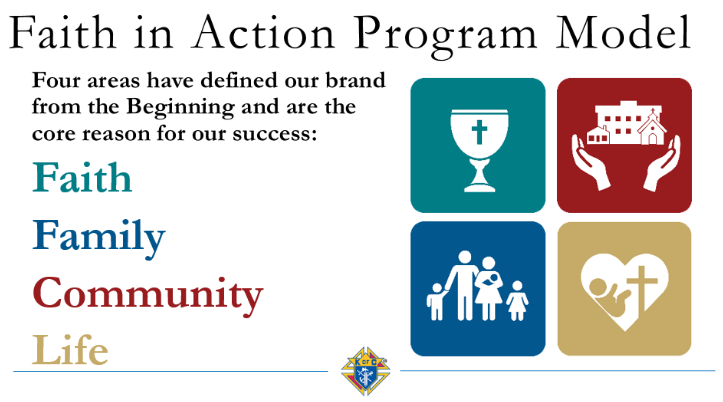 You can become part of our Council Faith in Action Program when you join. We have a rich set of programs and projects where you can assist in any of the four areas shown in the Kinghts of Columbus Program Model. Click on the drop-down menu above under Knights Council 4584>Programs and explore the opportunities. Another Important Feature of Membership is Our Insurance. The Knights of Columbus was founded to take care of widows and children who were left behind when their husbands/fathers died. The Knights began an insurance program to sustain their families in the event of their passing. We encourage you to take advantage of this service. Click on the link above image below to see more information on our insurance program.